Existentialism is a philosophy which emphasizes subjective experience over against subjective rationality. I think of it as the view that all of life is like playing a tape (DVD or MP4 or your format of choice)–Someone has pushed play, and there are no other controls such as pause, rewind, or fast-forward. Thus, everything is NOW. Reality happens. Even when we think, observe, analyze, etc., we do so in the here and now. In this view, history becomes somewhat fuzzy because we cannot revisit it (rewind). We can contemplate a memory that we have, but even this takes place as an event (an important term in existential thought) in the present. We might also read a text which reports ‘historical’ events. Still, the reading and reflecting on such a text is done in the present, too. So what about meaning? As you might have guessed, the meaning of a text (according to many existentialists) is not found in a text or in the author of the text. Rather, meaning happens as you ‘experience’ the text. Recall our movie player illustration above. We only have a play button. Thus, in this movie you cannot read a book and rewind to find the author’s original intent. Traces of the author might be found as you read the text (an event in the present), but this may or may not correspond to the author’s original intent. Further, since the play button is pressed, meaning is best thought of in terms of an experience, not a thing or object that lives somewhere else (like in an author). This view has weaknesses (though it is not without certain strengths, too). In the next post, I will offer a brief critique. It was a great experience reading what you wrote here. I feel that your true, ultimate and real intent was to impress upon us the power of internet blogging in communication. You may think your intent was something else, but who could truly arbitrate such a disagreement? You yourself may not even fully grasp your own intent (who ever does)? So that the real meaning of this blog may even allude you. But my experience as a technologist tells me that it was about Internet blogging and not about the surface message. Brilliant. What is brilliant is your response, Steve! 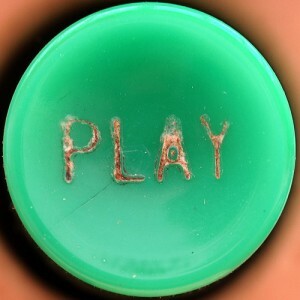 I may interact a bit with your comment in my next post (or should I say “play” with it?). i think your terminology might be a bit off. when it comes to being suspect about history, science, and objective positivism, i’d say you need to use the word “postmodern.” existentialism is more of a movement that many trace back to soren kierkegaard. he was a pious and devout believer in christ who took issue with the dead orthodoxy all around him. he wrote of actualizing our beliefs and the relationship of that endeavor to creating meaning. of course many unbelievers came along whom are called existentialists, such as nietzche, camus, herman hesse, jean paul sartre, ayn rand, etc. but the term “existentialism” has a closer association with certain literary big names who tapped into philosophy and wrote about characters trying to create or find meaning in their lives. when it comes to the subjective reading of texts, and the meaning that comes from the reading-act itself (the interaction between author, work, and reader), well, that discussion emerged out of discussions and works in literary theory in the 1950s and 60s (and even earlier) and is generally discussed under the umbrella of literary theory and hermeneutics, more specifically reader-response theory, postmodernism, and postcolonialism. i see the connection the between existentialism and reader-response hermeneutics, but what do we say about a figure like kierkegaard who quite obviously treated scripture as truth, tried to interpret its meaning, and went further and tried to actualize what he interpreted? i would say that we need MORE of that today and LESS reader-response theory. but i’d also say that ALL interpreters bring quite a bit of subjectivity to texts, and the days of positivistic modernity (which led to and underlies liberal biblical criticism) which claims total objectivity, are dead. now we must acknowledge our subjective baggage and interpret texts to the best of our ability and with humility. else you end up like these evangelicals who NEVER change their minds about any text whatsoever or one of these postmoderns who accepts as valid any and all interpretations whatsover. idk, just some caffeinated thoughts! Thanks for your comments, Mike. I think we’re on the same page. Terminology is always the trouble with discussions of philosophy! By “subjective experience,” I am referring to existentialism’s insistence on…well, reality being wrapped up in the existence of a subject (as opposed to a platonic view of reality). I differentiate this with “subjective rationality” by which I refer to the idea that an individual (subject) can understand an object as it is. I suppose this latter idea might be more commonly thought of as “objective rationality” even though I tend to think that rationality belongs to the subject, not the object. Perhaps I should reconsider my terms. As you picked up, the connection between existentialism and reader-response hermeneutics is where I am heading. In part 1 of the post, I referred to the common understanding of existentialism as “existence preceding essence.” What I set out to do in this series is tease out how such a philosophy affects hermeneutics. This all came out of my recent reading of Hans-Georg Gadamer and Paul Riceour which I briefly mentioned in the previous post. I look forward to your thoughts on the next post.